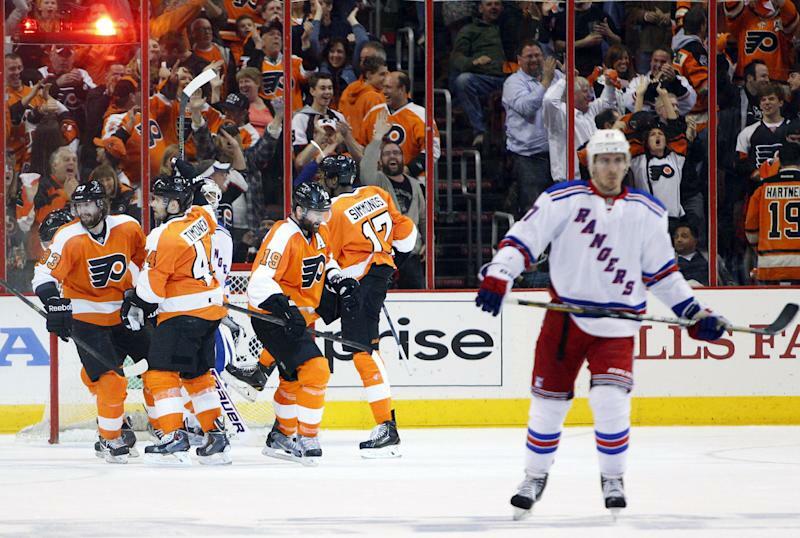 PHILADELPHIA (AP) — As they trailed in the series, the Flyers always believed they'd return to New York. Even on short rest, they're ready for one more comeback. "If we win Game 7, it's going to feel even more special because it's over there," Flyers captain Claude Giroux said. 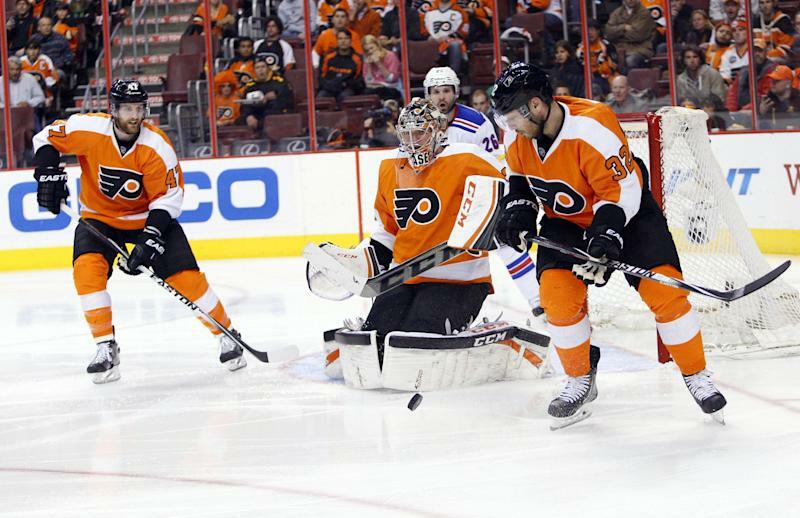 Wayne Simmonds scored three goals, Steve Mason stopped 34 shots and the Flyers beat the Rangers 5-2 Tuesday night to even their first Eastern Conference playoff series at three games apiece. Erik Gustafsson also scored as Philadelphia added a third Game 7 to the NHL schedule for Wednesday night. While the other two series last played on Monday night, the Flyers and Rangers have a quick turnaround before their final game at Madison Square Garden. "We know we can win a game up there," Flyers coach Craig Berube said. "It's confidence. Our guys realize that we can do it." Simmonds scored in the first period and twice more in the second for his first career postseason hat trick. Mason survived a busy first period and stopped 31 straight shots until Carl Hagelin scored late in the third. Mats Zuccarello also scored for New York in the final minute. By the third, Simmonds had ready helped stake the Flyers to a 4-0 lead and the outcome was a mere formality. Giroux had an empty-netter for the Flyers, who will try for a second win in New York this series. Simmonds, a 29-goal scorer who had one in the first five games, completed the hat trick with 4:41 left in the second. 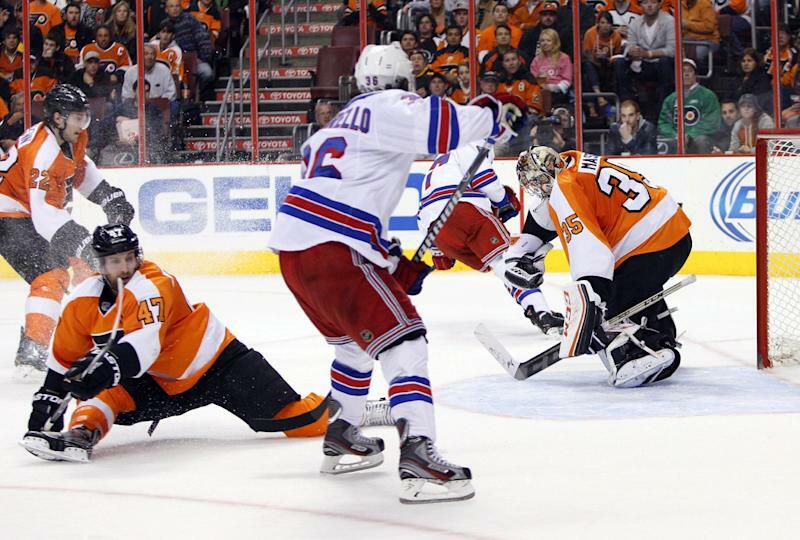 With a short break, Rangers goaltender Henrik Lundqvist was yanked for Cam Talbot to open the third period. Lundqvist stopped 19 of 23 shots. He couldn't stop Simmonds. "I already started thinking about (Game 7)," Lundqvist said. "You don't want to analyze this too much. We have a Game 7 at home." Simmonds camped out in the dirty area, in front of the crease, and pounded home three short goals that had Flyers fans going wild. On the brink of elimination, about the only thing that could slow down the Flyers were their fans — the game was delayed for a lengthy cleanup after they littered the ice with hats. Someone even threw a shoe. Outplayed for most of the series, the Flyers were lucky to escape the first period with a 1-0 lead. They were careless with the puck in their own zone and had nine turnovers, which led to a ton of work for Mason, who made 13 saves in the period. "It's always important to feel the puck early," he said. "I was able to make a couple of timely saves to start off the game and feel good for the rest of it. It was nice to be busy a little earlier in the game." Simmonds put Philadelphia in front with his third hack at a rebound on a power play. Across the street, the rain-delayed Philadelphia Phillies rang the home run Liberty Bell in celebration of the goal. Simmonds, a 6-foot-2, 183-pound forward, was just warming up. Brayden Schenn stripped New York's Dan Girardi of the puck, and then lost control in front of the crease. Simmonds was perfectly positioned off to Lundqvist's right side and pounded in the trickling puck for a 2-0 lead just 1:32 into the second. Simmonds again was just outside the crease to knock in his third goal late in the second for the 4-0 lead. "We knew the situation," Simmonds said. "You've got to get pumped up for games like this." After a sloppy first, the puck just seemed to bounce Philadelphia's way. Gustafsson, who did not play the first five games, came storming out of the penalty box in the second period, his stick hit the puck in a flash and he scored for a 3-0 lead. "It was a lot of fun when I saw the puck come down to me," he said. "I think it took a fortunate bounce." Mason, who had never won a postseason game until this season, was hardly challenged in the last two periods as he chased the shutout. He snared Benoit Pouliot's point-blank shot in the second period and made an out-of-nowhere kick save against John Moore in the third. "You've got to hop on the train and put it behind you. I've got a few episodes of 'Scandal' to catch up on," Mason said, referring to the popular TV show. The Rangers had scored four goals in three other games this series. New York is 13-2 in series it has led 3-2, but the Rangers have lost 12 straight games in which they had a series lead. "There's nothing better than playing in those Game 7s when you're a part of them," Rangers defenseman Marc Staal said. "I think we have to forget about it and put it behind us." NOTES: Flyers D Nicklas Grossmann had surgery to repair tendon damage in his right ankle suffered in Game 4. He could miss up to 10 weeks. ... Simmonds gave the Flyers their first two-goal lead of the series since his empty-net goal in the final minute sealed the win in Game 2. ... The Flyers beat the Rangers 4-3 on May 5, 1974, in the only other time the teams played a Game 7. They went on to beat Boston to win their first Stanley Cup.